Order today and receive free standard shipping on your Replacement Welch Allyn 72200 3.6 Volt Rechargeable Battery. Only valid in the contiguous 48 states and not valid with any other offer. This replacement battery is compatible with Welch Allyn portable hand-held rechargeable handles. Insert replacement battery "bottom" side up. CAUTION: Insert battery fully until seated. For convertible handles, match polarity marking with those on instrument when inserting replacement battery. Screw bottom cap back into place. Ensure the plastic cap is securely attached to the bottom cap. 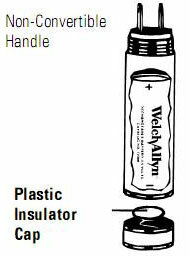 If the insulator is missing or broken, contact Welch Allyn for a new bottom cap. This Welch Allyn 3.5-volt rechargeable battery is for models 71000, 71010, 71000, 71010, 71020, 71050, 70700, 70710, 70720, 70750 (non-convertible, rechargeable handles with self-contained charger), insure that plastic insulator cap is intact and securely seated on spring. If missing or damaged, install a new cap before using. DO NOT INTERCHANGE BOTTOM CAPS BETWEEN DIFFERENT MODELS OF RECHARGEABLE HANDLES. USE OF INCORRECT BOTTOM CAP MAY DAMAGE THE BATTERY OR CAUSE THE HANDLE TO OVERHEAT. BURNS MAY OCCUR FROM AN OVERHEATED HANDLE. My Otoscope battery died and the spare wouldn't hold a charge for more than 10 min. I ordered and it arrived jus a couple of days later. Priced right and worded immediately. I have your web address handy for other needs. Thanks! I ordered 2 Batteries. One came in dead. When I contacted Customer Service they replaced the battery no problem. Which is great Customer Service, It came in quicker than the original order so the inconvenience was not so bad. All in all good experience. User-friendly site, accurate, prompt shipping. The company was fast, had just what I wanted/needed, and a much better price than everyone else. I ordered the wrong battery for my otoscope. When I emailed the company, they responded immediately and sent the one I needed. I received it right away and had no difficulty returning the first battery for a replacement. They also had the best prices of all the companies I researched. Perfect! Just what I needed. Prompt delivery. NOTE REGARDING ITEMS MARKED IN RED: If you battery is shorter than 1.9", please see Item # BAT-72100 instead. Battery Mart's purchasing department constantly works with suppliers to offer our customers the web's best prices. But we cannot guarantee our negotiated rock bottom prices on Replacement Welch Allyn 72200 3.6 Volt Rechargeable Battery will remain this low after April 23, 2019. Buy today for $24.95 and save ($24.95) (-inf%).